Inevitably the Handel anniversary year is bringing a glut of boxed sets from the record companies, restrospectives pulled together – with varying degrees of artistic acumen – from large back catalogues. The now revived L'oiseau lyre label has a pretty distinguished back catalogue of trailblazing Handel recordings, so it's especially welcome to see them not sit on their laurels with this new set of the Twelve Concerti Grossi Op.6. 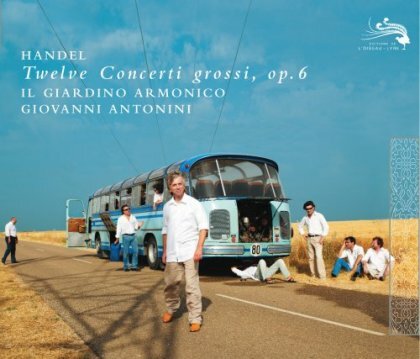 Handsomely presented, the set features Il Giardino Armonico under their director Giovanni Antonini, portrayed throughout the release as travelling salesmen of their own particular, Italian interpretations of this repertoire; their vintage bus is pictured broken down beside a golden field of corn and crossing a viaduct in a rather baffling bit of creative marketing, with more than a hint of Cliff Richard. Inside the booklet cover a snappily dressed Antonini – no doubt in Italian suite – strikes a model pose, staring into the distance. All this and the essay's pressing of the point that Handel's Concerti Grossi are particularly Italian works, following as they did the example of Arcangelo Corelli's own Concerti Grossi composed a quarter of a century earlier seems a little superfluous, however, when one plays the actual discs. Although it seems unfair, as Antonini does in the essay, to berate the 'dry style proffered by some ensembles, particularly by some English and Dutch groups', there is no denying the particularly Italianate energy the group brings to their readings. Right from the crisply articulated, springy rhythms of the first concerto's opening Allegro giusto, Il Giardino Armonico's approach is clear. With a virtuosity that's second to none, they produce readings that marry technical cleanliness with an irresistible joie de vivre. There's an improvisatory manner to the slow movements too and an impressive contrast between the imperceptible hush of the soloists' dialogue in parts of No.1's Adagio and rest of the players' severe interjections. Leading into that concerto's penultimate Allegro, the playing of violinists Enrico Onofri and Marcho Bianchi is wonderfully light and frothy. The same pair are outstanding again in movements such as No.2's urgent second Allegro, inspiring their colleagues to similarly sprung, playful performances. There are occasions where the performances might, for some listeners, cross the line into over-exuberance, and this is especially the case in some of the slow movements, where the contrasts between the often plangent, aria-like lines of the concertino instruments and the ripieno group's strong interjections can be overplayed. However, on many occasions, this seems like simply an extension of the group's responsiveness and imagination; the results are always far from routine or run-of-the-mill. The arresting droning that accompanies No.3's 'Polonaise' is one example of these instrumentalists' invention, something which made their famous Teldec Four Seasons such a revelation. The control they bring to No.4's Largo e piano is breathtaking, as is the simplicity brought to No.12's beautiful Aria. Antonini's version of these great works enters a very competitive field and any claims made that an 'Italian' approach is of greater validity to any other is patently spurious, based on a very one-sided musical argument. Any claims that geography can bring any sort of additional authenticity are dangerous – pace Canadian group Tafelmusik's wonderful Sony recording of the Op.3 concertos – and Handel was nothing if not a prototypical cosmopolitan, who would appropriate national forms and traditions and simply make them his own. Nevertheless, as there's depressing talk about regarding L'oiseau lyre's 'parent' company, Decca, it's encouraging to see some sort of renaissance with this fine release joining the high profile Sonnambula from a couple of months back. Although it's strange to see a label's marketing for a release based, essentially, on undermining many of the groundbreaking achievements of its own distinguished back catalogue, Il giardino armonico's Handel is hugely enjoyable on its own terms. Rather than provide any sort of new authenticity, though, we simply get further proof of the vitality of these works. The recorded sound is the label's typical blend of fine detail and full-bodied directness.